Tadoba National Park is one amongst the most beautiful national parks in Maharashtra and since it is located in the vicinity of places like Bhopal and Nagpur, it is a perfect weekend getaway for the people looking to spend some time amid lush greenery and rich wildlife. It is also a perfect place for photographers as they can capture the rarest of natural beauties on their cameras. Tadoba National Park is located in the Chandrapur district and is the oldest national park in Maharashtra with an area of about 625 square kilometres. It has also been declared a tiger reserve and hence, you can spot several tigers within its boundaries. So, what do you think of planning a trip from Bhopal to Tadoba National Park this season? Covered with rich dense forests and luxuriant plains, Tadoba National Park can be visited anytime during a year as the temperature and climatic conditions in the region remain bearable throughout the year. However, if you are looking to witness the grandeur of Tadoba National Park at its best, then the best time is from October until the end of April. By Air: You can take a direct flight to Nagpur airport and then from there you can hire a taxi to Tadoba National Park, which is located at a distance of about 130 km. By Rail: The nearest railhead is at Chandrapur at a distance of 35 km. Once you have reached the station, you can hire a cab to the national park. 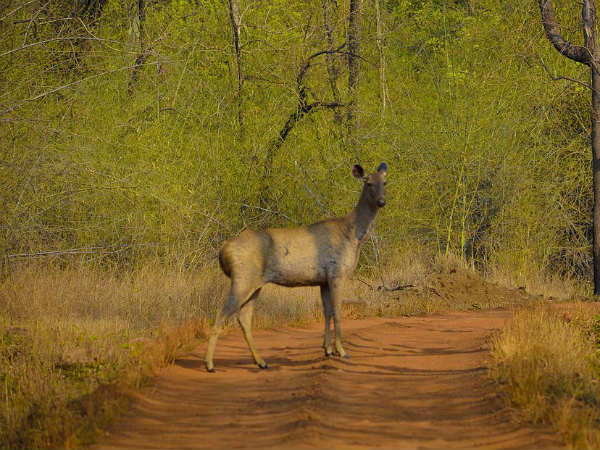 By Road: The region of Tadoba National Park is well connected to nearby cities and towns and hence, it is easily accessible by road. While on your way to the national park from Bhopal, you can take a break at the following places and explore their beauty and richness in history and nature. Located on the banks of Narmada river and situated at about 72 km from Bhopal and 418 km from Tadoba National Park, Hoshangabad is an ancient settlement, which dates back to the 15th century as per records. It is named after Hoshang Shah, the then ruler of the Malwa region. Hoshangabad is famous amongst tourists for its picturesque and serene ghats, where you can certainly feel the essence of unpolluted and calm nature. Apart from its beautiful ghats, you can also explore its other tourist spots which include rock painting of Adamgarh Hills, Hushang Shah Fort and Salkanpur. Pachmarhi, an enchanting hill station, and Satpura National Park are two other alluring places which you can visit if you are looking to explore beyond the boundaries of Hoshangabad city. Betul is a beautiful town in Madhya Pradesh which is known for its age-old culture and beautiful temples. It is also popular amongst several offbeat travellers for its natural surroundings flourishing in the form of waterfalls, hills and plains. The major places to visit here include Balajipuram Temple, Rachana Waterfall, the Jain pilgrimage site of Muktagiri, Kukru Khamla and Multai. Betul is located at about 312 km from Tadoba National Park and 178 km from Bhopal. One of the major and fast-developing cities in Maharashtra, Nagpur is commonly popular amongst tourist as the Orange City due to its large production of Nagpur oranges. However, it is also popular for its other historical and natural sites. The major places to visit here include Swaminarayan Temple, orange fields, Deekshabhoomi, Khindsi Lake, Gorewada Zoo and Ramtek Fort Temple. Nagpur is located at a distance of around 350 km from Bhopal and 130 km from Tadoba National Park. Finally, you have reached the lands of rich biodiversity at Tadoba National Park after travelling a distance of about 490 km from Bhopal. Established in 1955, this beautiful national park is also home to several tribal people who have been living here for centuries. Tadoba National Park is named after God Taru, who is also referred to as Todoba and is worshipped by the tribal settlements. Even though most of the tourists coming to Tadoba National Park look out for tigers or capture the natural beauty of the park, it is still a favourite weekend spot for numerous photographers who come here to frame the beauty of different species of plants and animals. Apart from tigers, the major species found here include Indian leopards, sloth bear, gaur, striped hyena, barking deer, chital and sambar. Tadoba National Park is also home to several colourful species of birds and butterflies, which include birds like crested hawk-eagle and paradise flycatcher and butterflies like mormons and swordtails. Isn't it a beautiful world filled with hundreds of colourful species? Who wouldn't love to enjoy a wildlife safari and see some of the rarest of natural beauties? If you love capturing unseen splendours of nature and lazing by the lush green surroundings, then Tadoba National Park is a perfect destination for you. From wildlife safari to photography and visiting Tadoba Lake to exploring its forests, there is a lot do here. So, why not plan a trip to this mesmerising national park this season?